As an island continent, Australia is somewhat isolated. Therefore, it must rely on technology and alliances to be connected with the rest of the world. Despite its British influence, relationship with the United States over the last 60 years, and close ties with New Zealand, Australia remains staunchly independent and “Australian.” This class will look briefly at the history of Australia as an example of how a nation can work with other countries to advance common goals while maintaining its own identity. This will be used as framework to discuss how other countries (e.g., US, Canada, Mexico) can work together toward mutually beneficial outcomes while respecting national and cultural differences. The trip will highlight diversity of people and geography within Australia. Melbourne will highlight metropolitan Australia. We will visit the National Gallery of Victoria to view classic art and the Australian Centre for Moving Images to get a better look and Australian culture through film. We will spend the day on St. Kilda Beach where there is Luna Park (an amusement park) and Acland St., a popular gathering spot. Since Melbourne is sometimes considered the sporting capital, we will visit Tennis Australia, home of the Australian Open, and take in an Australian Rules football match. In Sidney we will explore the maritime nature of Australia. A visit to Philip Island will allow us to see penguins on the beach. 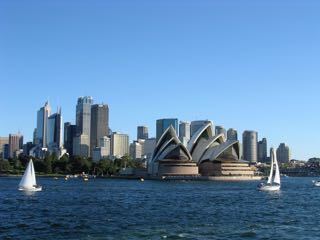 We will see the Royal Botanic Gardens, Sydney Harbor, and the iconic Opera House. We will also see the Hyde Park Barracks Museum, Art Gallery of New South Wales, and the Australian Maritime Museum. Of course, maritime means water and water means beaches. So, we travel from the Circular Que to Manly Beach and will travel form Bondi to Coogie Beach along the coastal walk. Before we leave Sydney we will watch a rugby match in the former Olympic stadium. From Sydney we will go to Gold Coast to play at Surfers’ Paradise. Australia Zoo, started by the Crocodile Hunter, is a trip up the coast. Finally, no trip to Australia would be complete without a snorkeling adventure along the Great Barrier Reef.